Here for you the real seats of the Ancient Greece Gods, the great Phidias' design. All models are in double version: Hi-poly-def and Lo-poly-def. The Greek Parthenon Zeus Throne is an accurate and hi-detailed reproduction of the Throne [Greek: thronos] used by Zeus, the king of the gods, as seen in the bas-relief [Block V n. 30] of the East frieze of the Parthenon [Athens, Acropolis Museum and London, British Museum]. The Greek Parthenon Stools Model A and B are an accurate and hi-detailed reproduction of the stools [Greek: diphros] used by the gods as seen in the bas-relief of the East frieze of the Parthenon [Athens, Acropolis Museum and London, British Museum]. 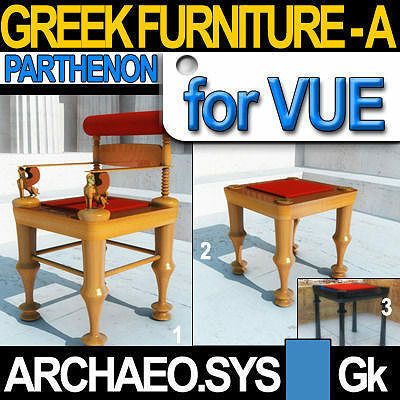 Stool Model A in particular is the one on which the gods Poseidon and Apollo sit during the Panathenaean procession. Stool Model B in particular is the one on which the gods Hera, wife of Zeus, [Block V n. 29], Dionysos [Block IV n. 25] and Demeter [Block IV n. 26] sit during the Panathenaean procession. The neat, classical and perfect design of this stool makes it suitable for any type of use with any type of scene also with the modern ones. In the VOB Files you will find two different formats of the same object: one is the hi-resolution and is intended mainly for the close-ups and the second is a lo-polygon object, to be used whenever the polygon count is important for your work-flow. The Greek Environment seen in the images is available separately as a Vue independent scene. Enjoy THE ARCHAEO.SYS 3D SERIES. The Archaeo.Sys 3D series is developing high-fidelity 3D reconstruction of Objects, Architecture and Scenes from Classical Greek and Roman Antiquity.